From left, Dean of Liberal Arts Bob Kleinschmidt, Forman-Schlossberg Scholarship recipients Shivani Chitre, Daniel Hurley, Giuseppina DeMeglio, Nicole Suto and Riley Rue, with MCCC President Jianping Wang and Vice President for Academic Affairs David Edwards. Brianna Rapp, who received the Outstanding Achievement Award in Performing Arts, introduces herself, along with her American Honors classmates. From left, Dean Winston Maddox, Professor of Biology Diane Hilker, Sam Zdanowicz, who earned top honors in biology and chemistry, President Jianping Wang, and Vice President David Edwards. Chaz Benning, center, was the recipient of the Mercer County Chiefs of Police Association Scholarship. Also pictured, from left, are Dean Winston Maddox, faculty members Liz Bondurant and Cavit Cooley, President Jianping Wang and Vice President David Edwards. 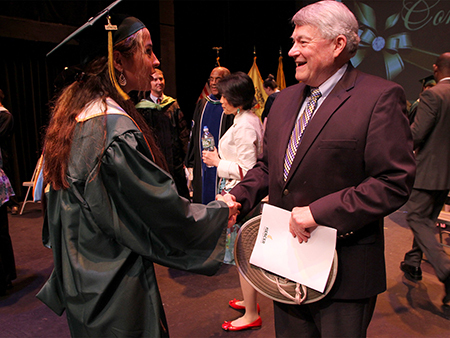 Graduate Liz Ovsyannikova is pictured following the ceremony with donor Jeffrey Cornelius. Cornelius regularly attends the Honors Convocation to present the Professor Betty Wallace Cornelius Scholarship for Excellence in Mathematics. 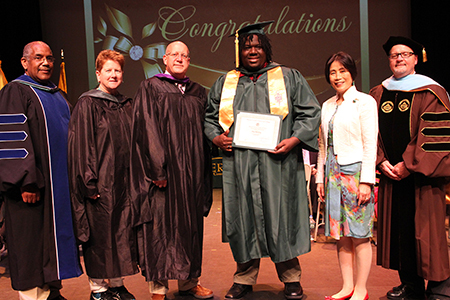 West Windsor, N.J. – Mercer County Community College’s (MCCC’s) top achievers gathered at Kelsey Theatre prior to Commencement on May 18 to be recognized for academic excellence at the annual Honors Convocation. Professor of Physical Education Robert Pugh, the 2016 recipient of the Distinguished Teaching Award, presided over the ceremonies as students had their moment on stage to receive certificates and scholarships before a supportive crowd of family and friends. 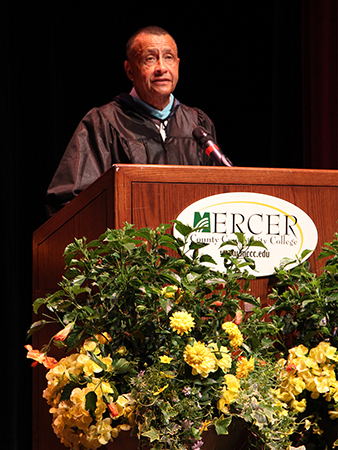 Among the 100-plus graduates were American Honors at Mercer, Phi Theta Kappa (PTK) and NJ STARS students. Also participating in the ceremony were Ed Gwazda, Executive Director of the MCCC Foundation, Dr. Diane Campbell, Executive Dean of Student Affairs, and Dr. David Edwards, Vice President for Academic Affairs. The deans from the college’s three divisions, Dr. Winston Maddox (Business and STEM), Dr. Robert Schreyer (Health Professions) and Dr. Robert Kleinschmidt (Liberal Arts), along with numerous faculty members, were on hand to participate in the presentation of awards. Graduates from all three divisions of the college were called to the stage. Many of these high-achievers completed their degrees while working full- or part-time. Some were returning adult students who have already earned bachelor’s degrees in other fields and are changing careers paths. Others in this noteworthy group achieved success as first generation college students or are as non-native English speakers. Several top scholars received multiple awards. Among them was Sam Zdanowicz, who received the William Dowd Biology Award, the Excellence in Organic Chemistry Award and the MCCC Faculty Association Scholarship in honor of Professor Emeritus David E. Collier. Zdanowicz will transfer to The College of New Jersey in the fall and plans to attend medical school, with the ultimate goal of becoming a surgeon. While at Mercer, Zdanowicz was active in student government and served in PTK. He also conducted Honors research at Medical Diagnostics Laboratory and will complete a research internship at Princeton University this summer. The American Honors at Mercer program was strongly represented during the ceremony. A record 54 graduates introduced themselves on stage. 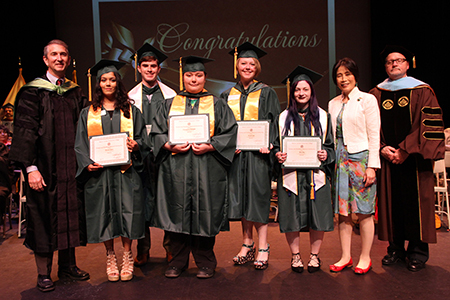 Additionally, 29 members of the PTK National Honor Society, including Jason Lima, a Business Administration graduate who was selected to the PTK All-State Academic Team, received enthusiastic applause. Lima will transfer to Rider University in the fall to study Global Supply Chain Management. Scholar athletes were also recognized for high academic achievement. 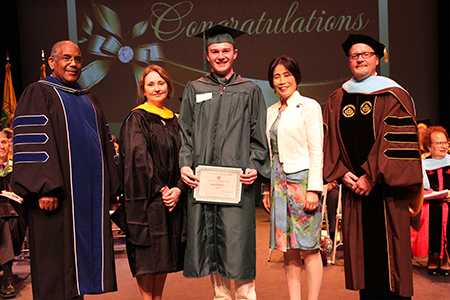 Baseball player Anthony Boselli earned the Dr. Cynthia Schaffer Memorial Scholarship. (Boselli, who was named to the All-Region 19 and All-GSAC First Teams, was unable to attend the ceremony because the Vikings were on their way to Baltimore to play in the Northeast District championship.) A second baseball player, Ross Talbot, and three-sport athlete Taymani Rivera-Kissling were recipients of Forman Athletic Memorial Scholarships. Rivera-Kissling, who completed her Mercer degree in December, was proud to return to campus after a successful first semester as a transfer student at Monmouth University. Also among the numerous scholarship recipients were 10 graduates selected for Albert B. Kahn Scholarships. This thriving endowed scholarship program continues to support both continuing and graduating students. 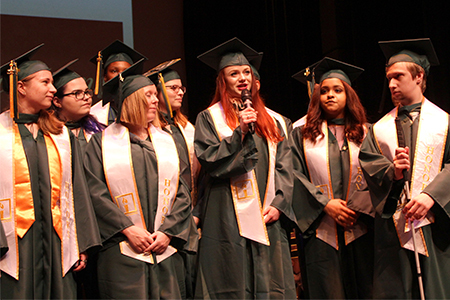 Other graduates recognized at Honors Convocation were 27 NJ STARS graduates, 10 new members of the Alpha Mu Gamma National Collegiate Foreign Language Society, and 27 students who were selected for Who’s Who Among Students. Five graduates will transfer to William Paterson University (WPU) at Mercer in the fall with Transfer Presidential Awards from WPU and two will transfer there with PTK scholarships.